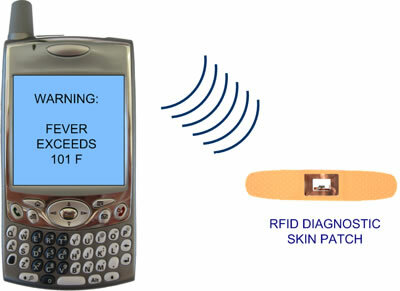 RFID diagnostic sensor patches that can be read by RFID-enabled (Radio-Frequency IDentification) cell phones are under development by Gentag, Inc. and The CORE Institute. The system should make it easier for physicians (and patients) to monitor their condition post-surgery using RFID-enabled cell phones. The RFID skin patch sensors will facilitate the monitoring of temperature, blood pressure and other conditions. It should also be easier for patients to monitor their own condition when released from the hospital. "We believe that cell phones are the ideal tools to enable consumer-based diagnostics and that The CORE Institute® has identified a unique market to illustrate how low cost RFID technologies combined with cell phones can save costs in medicine," announced Dr. John Peeters the founder of Gentag. "The CORE Institute® believes that this new technology platform will not only decrease the cost of health care delivery, but more importantly will markedly improve patient safety and outcomes due to earlier and more accurate diagnosis of changes in a patient's condition." Via Gentag and CORE RFID Diagnostic Sensors and the Gentag company website.